Cyril Burton North was a Canadian mining engineer from Nova Scotia who enlisted in Sep 1914 with Canadian Engineers and went over seas. 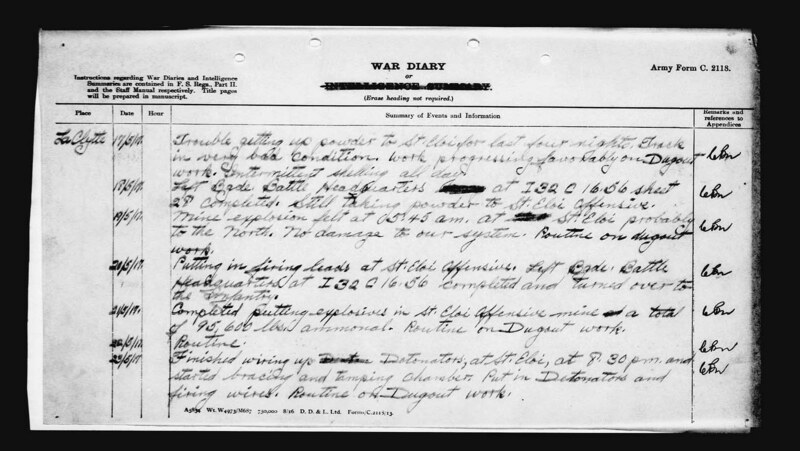 He spent some time with the Royal Engineers before June of 1916 when he was assigned as OC 1st Canadian Tunneling Company. It appears he remained a Royal Engineer Major until July of 1917. He fired what was known as the St Eloi Crater near St Eloi Belgium a few miles S of Ypres on June 7 1917 Here`s what it looked like. Here`s an excellent map by a group that studies this topic. This link tells you all about the WW1 use of underground mines. The mines they planted were all detonated as shown above on 7 June 1917. This was part of the Messines Offensive which led to the 3rd Battle of Ypres and ended at Passchedaele in November 1917 After the 7th June blast the Tunnelling Companies turned more to surface operations and road building. Maj North went on to a distinguished career in mining. One of his last projects was supervising the removal of the Ripple Rock Hazard to navigation near Campbell River BC. CBC Background and Video showing what the St Eloi Crater firing might have looked like. This entry was posted in Canadians in Belgium, Mapping. Bookmark the permalink.